Habit: Perennial mat to shrub, (1)2--15 dm, 2--25(30) dm diam. Stem: 0.3--2.5(3) dm, tomentose, hairy, or glabrous. Leaf: cauline; blades 0.6--1.5(1.8) cm, 0.05--0.4(0.6) cm wide, generally linear, tomentose, hairy or glabrous, margin generally rolled under. Inflorescence: 0.2--20 cm, 0.2--15 cm wide; branches tomentose, hairy, or glabrous; peduncles 0; involucres (1)3--8, 2--4 mm, 1.5--3 mm wide, tomentose, hairy, or glabrous. Flower: 2.5--3 mm, glabrous or hairy; perianth white to +- pink, lobes generally elliptic to obovate. Fruit: 1.8--2.5 mm, glabrous. Note: Other variety in central Baja California. Habit: Plant generally rounded shrub, 6--15 dm, (8)10--25 dm wide. Stem: tomentose or glabrous, generally +- gray. 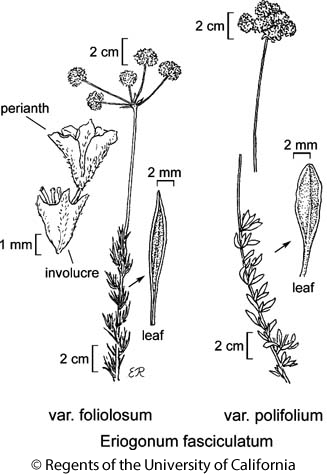 Leaf: blades 0.6--1.2 cm, 0.1--0.4 cm wide, densely tomentose abaxially, less to sparsely tomentose adaxially, margins generally rolled under. Inflorescence: open; branches tomentose or glabrous; involucres 3--4 mm, (1.5)2--2.5 mm wide, hairy. Flower: hairy. Chromosomes: n=80. Synonyms: Eriogonum fasciculatum subsp. foliolosum (Nutt.) S. Stokes; Eriogonum fasciculatum var. obtusiflorum S. Stokes; Eriogonum rosmarinifolium Nutt. var. foliolosum Nutt. Citation for this treatment: James L. Reveal & Thomas J. Rosatti 2012, Eriogonum fasciculatum var. foliolosum, in Jepson Flora Project (eds.) Jepson eFlora, http://ucjeps.berkeley.edu/eflora/eflora_display.php?tid=58545, accessed on April 19, 2019. CW, SW, widely cult, occasionally established from roadside planting NW, CW, SW, D; Markers link to CCH specimen records. Yellow markers indicate records that may provide evidence for eFlora range revision or may have georeferencing or identification issues. Purple markers indicate specimens collected from a garden, greenhouse, or other non-wild location.